A lot of people have been asking me to write about wide-angle macro. After a long period of time in which I was debating how to approach this topic, I decided that instead of giving a word-by-word recipe for making wide-angle macro photos, I am just going to write how I achieve my shots and give some useful tips. There is already a heap of great articles online, and at the end of this series of posts I will give a list of ones I recommend checking out for anyone interested in attempting this unique style. The idea of wide-angle macro is to use a wide-angle lens to include a small-sized subject and its environment in a single photo. When I think about it, ever since I held a camera in my hands I was trying to get that “look” with an insect standing in the middle of its habitat. I remember trying to do this using my film camera, but back then I did not have the knowledge or the experience to tackle this. And here comes the first tip for anyone trying to learn this technique – you must understand the optics of your lens. Not literally the physics of optics (although it does help, I admit), but the characteristics of that particular lens: how close can it focus? What is the working distance? Can it focus to infinity? Just by answering these three questions you are able to get an idea whether your gear can be used for this style. Caper bush (Capparis spinosa) overlooking Daliot stream, Golan Heights, Israel. Canon 7D, Sigma 10mm fisheye, x1.4 teleconverter. 1/125 at f/14, ISO100. Fill twin-flash with DIY diffusers. Now, similarly to other genres of photography, in wide-angle macro there are many different ways to achieve the same result. You can use stand-alone ultra wide-angle or fisheye lenses, add an extension tube to get more magnification, build a relay system, or even use a peephole lens. Some ways are cheaper than others. There are also small-sized point-and-shoot cameras that are able to produce this kind of photos. It all depends on the amount of money and effort you are willing to invest. I use a dslr and several different lens systems for wide-angle macro photography, each has its own advantages and disadvantages. I highlighted in the photo captions which system I used so you can get an idea about the properties of each one. Juvenile eastern spadefoot (Pelobates syriacus), Central coastal plain, Israel. Canon 7D, CCTV relay lens system. 1/15 at f/16, ISO1250. Fill twin-flash with DIY diffusers. With the recent release of the fully manual Venus Optics Laowa 15mm 1:1 wide-angle macro lens, I suspect wide-angle macro will become even more popular over the next few years. I was hoping I could receive a unit to review and compare to the other systems I own, alas, Venus Optics Laowa never got back to me (this recently changed – see here). Despite being a somewhat niche lens, I have no doubt that in the near future we will see more and more lenses with similar capabilities, maybe even with automatic aperture and focus control. 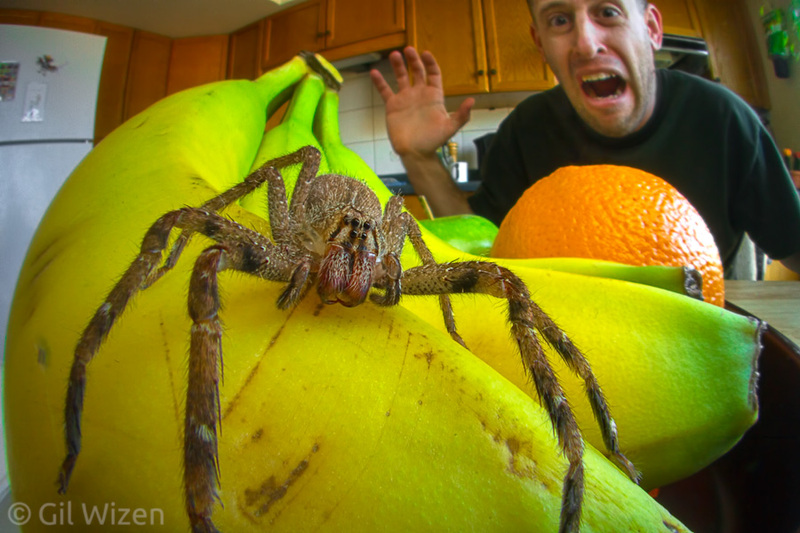 Banana spider aka Brazilian wandering spider (Phoneutria boliviensis) in my kitchen. While this wide-angle macro shot was not taken in the field, it shows that once the technique is mastered, it can be reproduced from scratch in almost any situation. Canon 7D, CCTV relay lens system. 4 sec at f/16, ISO400. Fill twin-flash with DIY diffusers. Magnification – This is more of a technical issue, as each wide-angle lens has a different maximum focusing distance and maximum magnification. You want to get the subject big enough in the frame so it will not end up “lost” in the background. If the subject is big (like some reptiles and amphibians) then this is not really a problem, but small arthropods are much more difficult to shoot in wide-angle macro. We still do not have the technology to produce a high-quality photo of a springtail walking about in the dense forest. Insufficient magnification can be solved by adding a short extension tube, but this causes several other issues (more on this later). Male giant mosquito (Toxorhynchites sp. ), Cayo District, Belize. Although this is a relatively large mosquito, it is still a small insect so I used a short extension tube to achieve more magnification. Canon 7D, Sigma 10mm fisheye, x1.4 teleconverter, 6.3mm custom-made extension tube. 1/10 at f/22, ISO1250. Fill twin-flash with DIY diffusers. Interesting perspective – Focusing close on the subject alone is not enough. Getting low and bringing the camera to the same eye level as that of the subject’s is important to give viewers the impression that they are a part of the scene (this is true for all styles of nature photography, by the way). In addition, if the background is too busy or too far from the subject, the result will be aesthetically unappealing. A good way to solve this issue is to have some sort of gradual transition from the subject to the background. This can be done by including a branch or a vine that leads the eye from the subject to the background (or vice versa), or by actually letting the subject “drift” into the background. A good method for dealing with this issue (given to me by Piotr Naskrecki, one of the true masters of this photography style) is to look through the viewfinder and search for alternatives ways to compose the photo, however I often find that I actually need to take several shots of different perspectives before I decide. An example to show the process of choosing the right composition: A. Background too far from foreground, no gradual transition; B. Overall busy composition with too much depth of field, subject will be lost; C. Good transition from foreground to slightly out-of-focus background, but background is still too busy; D. Good balance between foreground and background. This is the composition I decided to go with eventually. Thistle Mantis (Blepharopsis mendica), Central Coastal Plain, Israel. Canon 7D, Canon 14mm. 1/125 at f/14, ISO200. Fill twin-flash with DIY diffusers. Telling a story – This one is a bit harder to master. You need to get the other elements right first, but once again, that alone is usually not enough. There are many (technically) good wide-angle macro shots out there, but they include a subject plastered over a poster-like background and in my opinion something gets lost there. In general, a good photo must be engaging, and wide-angle macro is no exception. You want to bring the subject’s perspective of the world and way of life to the viewer. Marching of desert locust (Schistocerca gregaria) nymphs in the Negev Desert of Israel. I wanted to show how the grasshoppers were moving in a thick column, almost like a flowing river. Canon 7D, Sigma 10mm fisheye, x1.4 teleconverter. 1/125 at f/16, ISO100. Combining these elements is no easy task, especially from the technical aspect of things. In most cases, closing the aperture to get more depth of field will result in less light hitting the camera’s sensor. In other words, to get a proper exposure you need either to increase the ISO value or to use a slower shutter speed, sometimes even both. Using a tripod can help when taking long exposures, but sometimes it is physically impossible. And increasing the ISO beyond a certain value might boost the noise in the photo, resulting in a low-quality image. It’s all about compromises. In the next posts I will discuss common misconceptions and some of the major problems in wide-angle macro photography. If you have any other topic you would like me to address in the next posts – please let me know in the comments and I will do my best to answer. Just found this article. Well written and very useful. I’m a total amateur and “play” with mobile phone camera and clip on fisheye lens, but definitely like close-up images look. I sort of call it a “contextual approach” because the point of view gives much to see also on the background.